Augusta Locally Grown is a non-profit that ventures beyond market and into the literal backyards of its community (we’re talking hundreds of raised beds, teaching gardens, etc). G.R.O.W. Harrisburg, a multi-partner initiative with various programs, began as an idea Kim Hines, ALG Market Manager, scribbled down on paper summers ago. It has since become a purposeful creature with far-reaching dimensions. Harrisburg was a diamond in the rough, and the neighborhood has been enriched by all the time, effort, and passion that has been poured into it these past few years. Kim and other dedicated, local and wholesome food enthusiasts have really dug into the inner-city neighborhood. There, they’ve made educational, hands-on opportunities available and enabled involvement and access to fresh, local food. Kim oversees three ALG markets, but by far, the love child of G.R.O.W. Harrisburg is the Veggie Park Farmers Market. It is a small market, but boy does it have a heartbeat. The community shows up for the market and no one is left out. Some community members are employed at the market while others have bloomed into vendors, thanks to their backyard endeavors. From the ground up, ALG is making its mark. Check out ALG and the Veggie Park Farmers Market via our Instagram for the next two weeks. Kim Hines: The Veggie Park Farmers Market is now in its 5th year. Located in the inner-city of Augusta, GA, we strive to make fresh, local, nutrient-dense foods available and affordable for people of all income levels. The market is run by two paid market managers – hired from within the community – supported by a team of student volunteers from the Medical College of Georgia. We double EBT, we offer transportation, and we run a Fruit & Veggie Prescription program, all with help from Wholesome Wave Georgia. We also offer free gardening advice with the Georgia Master Gardeners; cooking demos with local chefs trained in the Old Ways method to appeal to diverse cultural tastes; kitchen equipment give-aways and nutrition education with the Georgia Food Oasis; a junior market manager program for middle school students; and free healthy summer kids meals and activities in partnership with Icebox Urban Farm. This market is one of six programs run by G.R.O.W. Harrisburg, a collective of community organizations all working together to address truly dire consequences that diet-related illnesses have had on our city. G.R.O.W. stands for “Growing ouR Own Wellness,” and – indeed – we are doing just that. 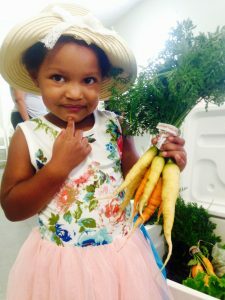 KH: The Veggie Park Farmers Market is run by Augusta Locally Grown, a 501c3 nonprofit that manages several farmers markets as well as a year-round calendar chock full of local food educational activities. This market is located outdoors, along the banks of the historic Augusta Canal, which runs parallel to the Savannah River. We are quite urban, and intentionally located alongside a large public housing community. The canal and its backdrop of the now-quiet Sibley Mill – an antebellum-era powderworks and textile factory – give the Veggie Park Farmers Market a nature-dipped feel right in the middle of the city. This market is small, with about 14 vendors at most on any one day. But we are proud to say that these are some of the most beloved and talented farmers in all of Augusta. Also, we understand our work as “radical healthcare,” and – thus – partner with as many medical professionals and agencies as possible to guide people toward our market. KH: All of our promotional materials use pictures of members of our community as “models.” Our primary marketing tool is postcards; we order and pass them out like candy! We use Facebook and emails, and we list ourselves in all the free on-line and publication calendars. We are also well-served by our local media with regular television and newspaper stories about our intention to address diet-related illnesses with as many creative activities as possible. KH: We have truly begun to change the reputation of an inner-city neighborhood from one in which many people were afraid to visit, into a community now known for its good, local food. In addition to the educational programs at our farmers market, we also use the market to encourage residents to grow their own food at home. As of this writing, we have installed 200 raised bed gardens at more than 55 homes throughout the community. We know that people are more likely to eat food they grow themselves. We also know that home growers are more likely to buy from local farmers what they cannot grow themselves. In fact, several of our home growers are now vendors. KH: Augusta is the home of Georgia’s premiere medical school, nursing school, dental school and post-graduate dietetic internship programs. And yet, despite this significant investment in healthcare education, Augusta was also ranked the “Fifth Fattest City in America” by the Center for Disease Control in 2012. The Veggie Park Farmers Market strives to be a force for change by connecting and integrating food and health in a fun, delicious, accessible setting.